Urine is rapidly becoming the preferred medium for neurotransmitter testing to ensure objective neurobiological assessment. This is because a) urine is the primary route of peripherally-produced neurotransmitter elimination; and b) it is non-invasive and cost-effective. This blog takes a look at how dried urine testing provides a superior advantage over standard liquid urine collection methods. Is a 24-hour collection necessary – or even desirable? The gold standard of neurotransmitter testing in urine involves an inconvenient and mildly embarrassing collection of liquid urine over a period of 24 hours into a jug. The awkwardness of this type of collection is further compounded by the fact that in certain circumstances during the day, it is nearly impossible to get every last drop of the sample into the collection device, and a patient may even miss some collections altogether. To circumvent these issues associated with the 24-hour liquid collection, dried urine can be used in place of the liquid sample, offering many advantages. Collecting urine on filter cards at 4 time points throughout the day is non-invasive, simple, straightforward and discreet – which allows the clinician and patient to get an accurate 24-hour clinical picture without the enormous hassle. For the neurotransmitter test, ZRT recommends collecting urine 4 times throughout the day - the first void of the morning; the second void, approximately 2 hours after waking; in the early evening around dinner time; and at bedtime. This method ensures both ease of obtaining the sample for the patient and stability of the sample during shipping and handling. When samples are received in the lab, the 4 dried urine strips are processed together to get an average value for neurotransmitters excreted throughout the day. An additional advantage of dried urine is that the strips can be processed separately as 4 individual samples to evaluate diurnal rhythms of the first-line stress responders, norepinephrine and epinephrine, in addition to cortisol, cortisone and melatonin – all critical to the clinical evaluation of the stress response. Every now and then, providers and patients ask ZRT if the first morning collection or the second morning collection alone can be used as a substitute for the 4 time-point collection. And the short answer is no. With good reason. Neurotransmitter levels do fluctuate dramatically during the day, with some neurotransmitters having very distinct circadian fingerprints. Averaged throughout the day, neurotransmitter levels, as determined by the 4 time-point collection, are a stable measure of the individual’s neurotransmitter status. Meaning that if you measure the average daily excretion of neurotransmitters over a period of a few days, the numbers will be approximately the same from one day to the next (assuming no changes in medications or supplements, and no interfering foods). However, neurotransmitter levels do fluctuate dramatically during the day, with some neurotransmitters having very distinct circadian fingerprints. Norepinephrine and epinephrine display specific diurnal rhythms – levels are low when we sleep and steadily increase over the course of the day to regulate blood pressure, heart rate and blood sugar and adjust the body’s response to stressors accordingly. 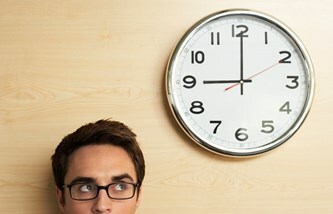 This diurnal fluctuation in norepinephrine and epinephrine levels is part of the body’s normal physiological response. Specifically, the levels of norepinephrine and epinephrine are lowest in the first urine collection of the day and reflect the body’s production of these catecholamine molecules during the night. Levels begin to increase towards mid-morning – a normal physiological response, thus the second urine collection captures norepinephrine and epinephrine production during that morning time period since the first collection. Levels then continue to increase towards mid-morning, peak in the afternoon, and decrease by bedtime with low levels during the night, so a graph of the levels over a typical 24-hour period would take the shape of an inverted U. It is because of these diurnal fluctuations that one cannot reliably exchange the first or second morning samples for the 24-hour one without first developing reference ranges from samples collected at very specific time points. On a similar note, it is precisely because of these diurnal fluctuations that laboratories testing urine collected at a single time point in the morning ought not to advise their patients to interchange the first and second morning urine samples. Without reference ranges developed from samples collected at specific time points to account for circadian rhythmicity, the clinical result will likely to be grossly inaccurate. 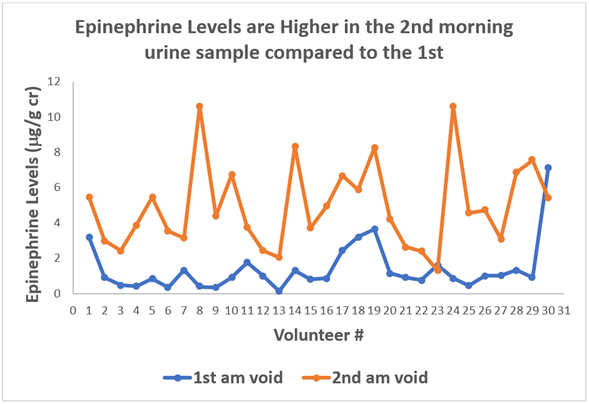 In a ZRT study, 30 healthy volunteers donated their first and second morning urine and the results were compared for epinephrine. Epinephrine levels in the second morning void (orange line), as a general rule, run higher than the first morning void (blue line). And for some of the volunteers, the second morning urine showed dramatically higher levels of epinephrine than the first morning sample. This means that if a patient collects their first morning sample, and the range for epinephrine was established based on the second morning values, then this patient’s result will fall into the "low" clinical range, yet that may not be a valid result for that individual. 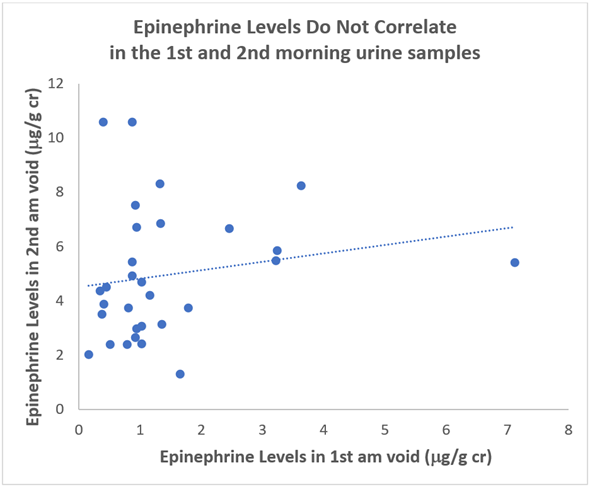 Additional analysis of these data shows that epinephrine values in the 1st and 2nd morning voids do not correlate with an extremely low value for the coefficient of variation of R2=0.0324 (if things correlate, then the R2 value ought to be closer to 1). Dried urine represents a tremendous advantage over liquid 24-hour urine collections for both patients and clinicians, but it is important to be aware of these timing issues and ensure that samples are properly collected. When testing is done right, it gives not just a blurry snapshot of a patient’s neurotransmitter status but instead a focused assessment that can really help pinpoint abnormalities in a diurnal rhythm, as well as an accurate assessment of overall neurotransmitter production without all the fuss of a liquid collection.